HAVE THE MUSICAL INFLUENCES OF THE PAST BECOME OBSOLETE? WHERE ARE HOLLYWOOD’S FEMALE FILM COMPOSERS? As a woman composer who has carved an enviable reputation inside the crucible of the Hollywood Film Music business, Nan Schwartz nonetheless remains an enigma to orchestras and concert music audiences around the world. This apparent anomaly can, in part, be ascribed to the imbalance in respect to opportunities for women composers generally, but given that Nan is a Grammy winner, 5-time Grammy nominee and seven-time Emmy nominee, it remains perplexing that the classical music world has taken so long to recognize her indisputable genius. 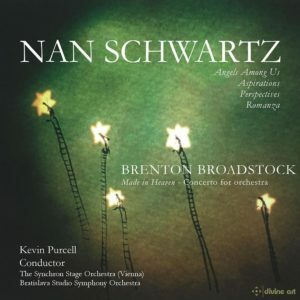 This album beautifully directed by the eminent Australian conductor, Kevin Purcell, brings to light through these premiere recordings the extraordinary music of this iconic, contemporary, American composer.